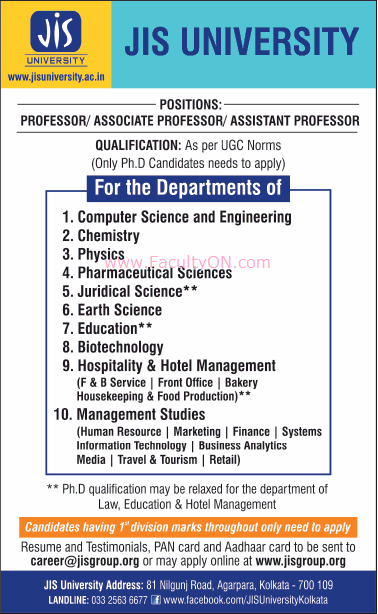 JIS University, Kolkata has advertised for the recruitment of Teaching Faculty- Professor / Associate Professor / Assistant Professor jobs vacancies. Interested and eligible job aspirants are requested to apply immediately from 01st December 2018. Check out further more details below. About University: JIS University is a private university located near Agarpara, West Bengal, India It was established in 2014 under JIS University Act, 2014. How to Apply: Interested and eligible candidates are requested to send resume along with copies of certificates, copy of PAN card, copy of Aadhaar card to the following email address or apply online at the official link provided below.